Archers were the first to land in Rio about a month in advance to acclimatise themselves to the conditions but that hardly made a difference to their performance as they were also among the first to return home empty-handed. 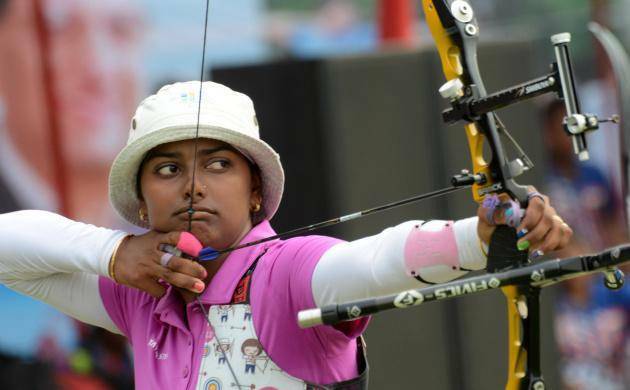 Way off the mark despite the best of preparations, Indian archers were left to count the losses after a second successive disastrous Olympic campaign which threw the sport itself into disarray in a thoroughly forgettable 2016. Archery was one discipline which generated a lot of hype in the run-up to the Olympics and the let-down was one of the big blows to India’s hit-and-miss overall campaign of one silver and one bronze medal show in Rio 2016. In the discipline, the biggest medal hopefuls were the women’s team of Deepika Kumari, Laishram Bombayla Devi and debutant Laxmirani Majhi but they bowed out in quarterfinals, losing to eventual silver-medallists, Russia. Leading 4-2 against the second seeds, India needed a draw to make semis but just could not handle the nerves as they lost the fourth set where Deepika failed to match her teammates’ two perfect 10s, allowing Russia to level and wrap the issue 5-4 in the shoot-off. The blame was back on the strong southern winds at the historical Samba Street, something that did not trouble their opponents. Among them the duo of Bombayla and former world number one Deepika had the combined experience of five Olympics with the latter boasting of a handful of World Cup medals besides winning at every other showpiece event. But Olympics continued to be a hurdle too big for Deepika, which will keep haunt her when she gears up for Tokyo 2020 as a 26-year-old. For India, the senior-most and low key Manipuri archer Bombayla impressed the most with a total score of 72 from her eight arrows including three perfect 10. In individual section, Deepika, Bombayla and the sole male member, Atanu Das signed off in the familiar last 16 stage. The 24-year-old Das impressed the most in his maiden appearance at the biggest stage by finishing fifth in the qualification round before making a round three exit. Till then, Satyadev Prasad had the best finish among Indians by advancing to the pre-quarters 12 years ago in Athens. An Olympic medal has eluded the Indian archers who have otherwise achieved almost every other feat, including winning a bronze at the youth level of the Summer Games, courtesy Atul Verma in Nanjing, China 2014. They have participated in the Olympic Games since the sport was introduced in 1988 Seoul and, barring 2000 Sydney when they failed to qualify, they have competed in seven editions but still failed to win a medal. Having burst into the limelight at a young age of 15 by becoming the cadet world champion in 2009 Ogden and two years later junior world champion, Deepika was the biggest hope. She has more than 10 gold medals at the world level including the team and individual at the 2010 Commonwealth Games when she stunned five-time Olympian and bronze-medallist Alison Williamson of Great Britain. By 2012 London Olympics, Deepika had transformed herself into world number one, along with her team, and it’s needless to mention that expectations skyrocketed.